Tuesday, August 6th, 2019 - 7-9pm at McBurney(Skeleton) Park. 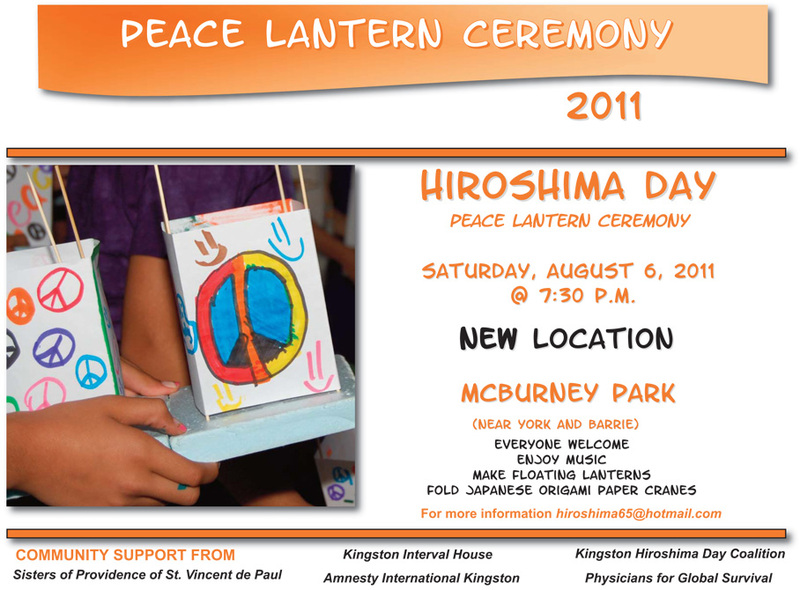 This is an online noticeboard for the Hiroshima Day Peace Lantern Ceremony held annually in Kingston, Ontario, Canada. See 2018 event photos HERE. See 2016 event photos HERE. Download the Colouring for Peace colouring book by Judy Tse HERE. See 2015 event photos taken by Hilbert Buist HERE. See 2015 event photos taken by Jolene Simko & Rick Cairns HERE. This ceremony, in one form or another, has been observed in Kingston for over thirty years and Hiroshima Day is marked all over the world. The Kingston Hiroshima Day Peace Lantern ceremony is both a secular and inter-faith event incorporating paper lanterns, storytelling, speakers, and song. The Hiroshima Day Coalition exists to give Kingston residents the opportunity to commemorate the 135,000 lives lost in the bombing of Hiroshima and Nagasaki, but also the lives lost in all nuclear accidents since, and to raise awareness of the use of nuclear weapons today. August 6th, 2019 marks the 74th anniversary of atomic weapons being turned on a civilian population for the first time. We hope you will join us in wishing for, and working towards, a world free of nuclear arms. Please see the About Us section for more. Below are an assortment of photos from the 2014 event. Photos by Jolene Cheryl Simko. If you have pictures from previous years to share. Please contact us!